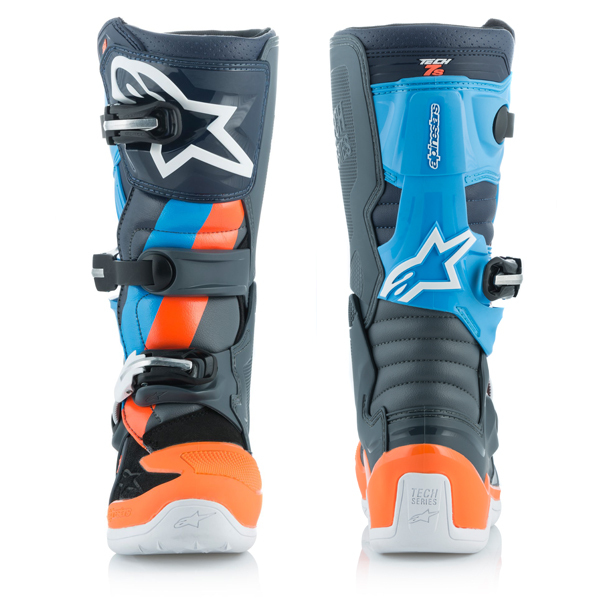 This year’s competition will once again see the rising crop of racing talent pushing themselves to the limit on the challenging Florida Supercross and Motocross tracks, and to celebrate this event, which showcases the best up and coming dirt bike talent, Alpinestars has created a Limited Edition ‘Magneto’ Tech 7S boot and gear set. 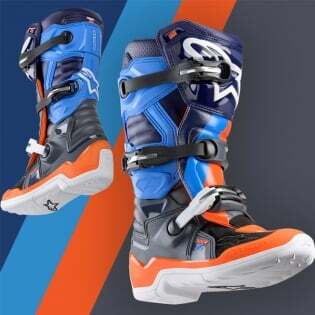 Featuring a bold anthracite, orange, fluo yellow and cyan blue color scheme, as worn by Jett Reynolds, the eye-catching ‘Magneto’ color scheme has been created to create a fiery, bright combination which allows aspiring dirt heroes to take to the track in a striking outfit designed to stand out from the crowd. 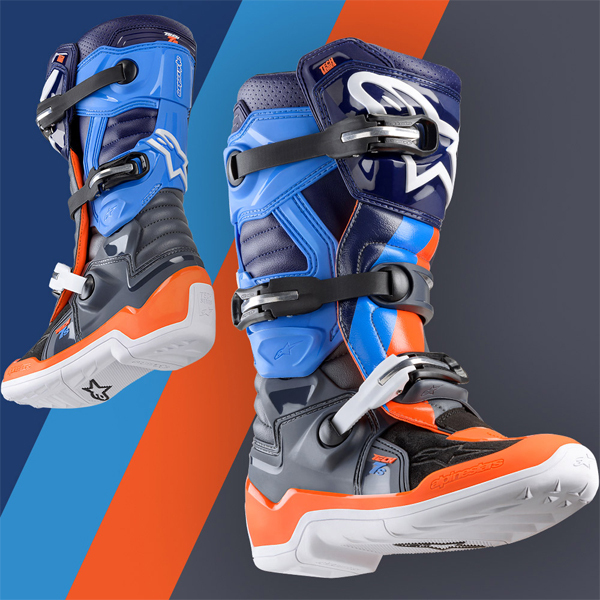 The CE certified Tech 7S is an advanced and protective boot that incorporates innovative materials and technology in a streamlined design for a lighter, more anatomically profiled performer. 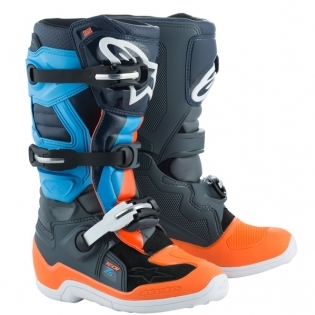 The ‘Magneto’ blends all of the performance properties of the Tech 7S in an anthracite, orange, fluo and cyan colorway which will appeal to younger riders. The Limited Edition ‘Magneto’ gear set has been designed to be paired with the ‘Magneto’ boots. The ‘Magneto’ Youth Radar gloves and Youth Racer jersey and pants feature the same technical innovations and performance as the rest of our motocross range, with the distinctive color combination allowing dirt riders to hit the track in an eye-catching outfit that is a fitting tribute to one of amateur racing’s most intense battles. The Tech 7s is specifically designed and sized for junior and/or smaller framed riders. PU reinforced microfibre upper for flexibility, abrasion resistance, water-resistance and weight saving. Material ensures consistent fit and is easy to maintain and clean. Contoured shin plate is injected with high modulus TPU for excellent levels of impact and abrasion resistance. Medial facing side incorporates TPU panel with specially designed sculpturing for maximum grip contact with bike and improved head and abrasion resistance. One piece injected dual compound foot shell with co-injected hard toe protector and integrated steel shank. 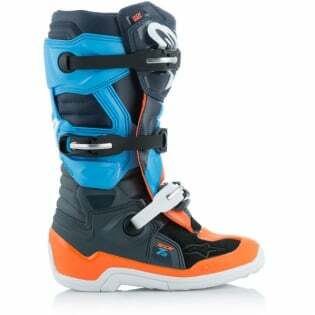 The shell is highly resistant to abrasion and impact, adds to the boots overall durability and improves boots streamlining. Excellent flexion provided by low profile medial and lateral pivot system to offer movement and support. Instep and achillies accordion flex zones constructed for superior control and support. Extended microfibre gaiter helps seal out excessive water and dirt entry. Compound sole is seamlessly integrated into the base structure for superior durability. High performing rubber grip patterning and feel. The sole is replaceable. Soft poly foam reinforcement on ankles and collar for long lasting comfort and shock absorption. Removable anatomic footbed for comfort and support ensures even weight distribution. 3D mesh textile with open cell foam for improved air circulation and comfort. Buckle closure system incorporates polymer and fiberglass buckle arms and high impact aluminium bridge closures for durability and weight saving. Buckle system features memory and a quick release/locking system with self-aligning design for easy, precise closure and improving riding performance and security. All buckles are easily replaceable.